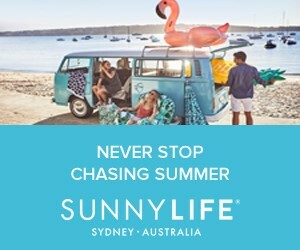 Weather you're exploring new territories on vacation or just spending the day running errands, finding a shoe that allows your foot to comfortably exist in its natural shape can change your entire day; cue my new Vionic sandals. Vionic shoes feature Orthaheel Technology for ultimate comfort that help to prevent knee and back pain. Vionic's have streamlined silhouettes which perfectly conceal their podiatrist-designed technology that can be your little secret. Give your feet a break from forcing them into fashionable heels and opt for these comfy chic Vionic sandals, which just so happen to also be good for you. Below are a few of my favorite pairs currently available. See the entire Vionic collection here! I love the scarf:) very cute. Good idea...I need the height...so always wear a heel of some description...but they can ache after a while! beautiful outfit dear!! love the scarf! Love this look :) love the color combination! Blue and white is one of my favorite combos! I also love your watch! love your watch sooooo much! nice outfit! Love the whole look! It makes me wish we had Old Navy here, in the UK. Loving all the pastels! And that watch is so cute! love this look! you look so adorable. nice outfit, love the watch. love those josephine and rio wedges! and I love that they're comfortable..even the most functional of flip flops ends up rubbing the wrong way by the end of the day. thanks for sharing! 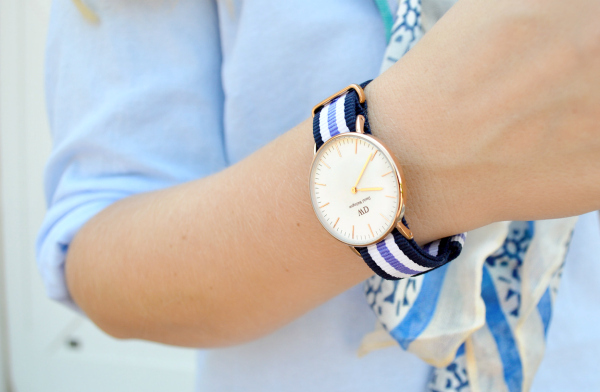 This scarf is beautiful and I have wanted one of those watches for ages! Great summer look, I love the colors! Super in love with this uber chic casual look!!!! Cute sandals :) Love your outfit. 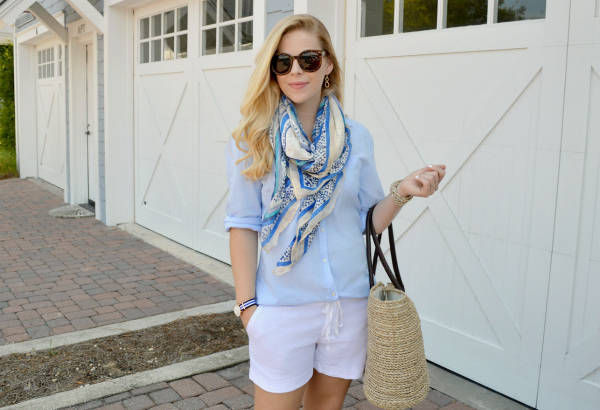 Loving this summer scarf look! So cute and love the outfit! I love it...and those shoes look super comfy!! I really love the "rio adjustable wedge"!! Ana, what a great look. I love how you wear your scarf. I have similar ones like this and for some reason the end results does not look like yours LOL. Is there a way you can share with us of how to make it look perfect like that? I am loving the aruba wedges ! Great Picks ! I don't know what I love more, the watch or the sandals. They're both so great. so cute! you look ready to board a boat!! I'm absolutely obsessed with this outfit, it's so simple and classy! And that watch is perfect! Classy, beautiful and simple! I love this nautical outfit. You are always an inspiration! I simply adore your scarf and watch! I'm going to have to try out these sandals! They are so cute but still look very comfy :) Also, love your scarf! I love all of the options. And the fact that they're made great is a bonus! Great look, hun. I adore this polished look and the sandals are so cute! Cute look! Loving your watch and scarf! Such a chic look! Love this summer look, esp. with that beautiful scarf. And that watch is amazing girl! All of those styles look comfy!! I love the blue more, when it's on you! nice and fresh look! These shoes seem like a God send! I've got to try a pair! 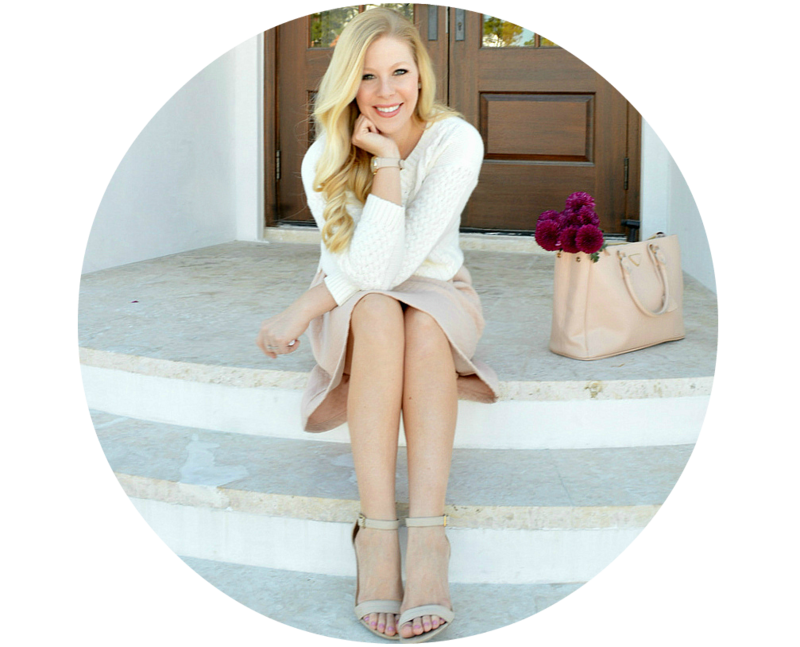 i was only 8 years old, and I've learned to make a fashion blog. I've been visiting your blogs, and I am very inspired by all of you blog.